I shouldn't have to explain this, but Noddy is a beloved children's character who appears in several books written by Enid Blyton. These books tell the stories that happen in Toyland, a place where Noddy lives with the other toys in bliss and harmony. Except for a few elves who occasionally cause trouble, but isn't that always the way with elves? As a kid, I really enjoyed these stories and still have a fond place in my heart for them. But even this cannot save A Day In Toyland from experiencing my brutal scrutiny. It may have only contributed to the following beating. The issues I have with A Day In Toyland are numerous, and large. Larger than the game itself, in fact, which can be breezed through in its entirety in under an hour. No, "breezed through" implies some level of enjoyment. The only fun I managed to wrangle out of this shovelware shiznitshow was mashing the "toot toot" button during driving scenes. There is precious little to appreciate here, because when no passion goes in, no passion comes out. It's that simple. You take beloved books, make a vapid animated series on it, and then cash in on that series with terrible games until it dies. This game starts with the same level of sincere hatred that carries throughout. 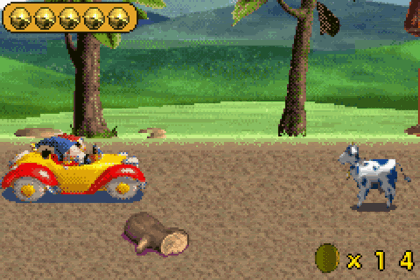 In the first level, Noddy must find his car. It's ten seconds worth of baby-crawling to the left. You could go to the right you can collect some coins, but they have no real purpose in the game. 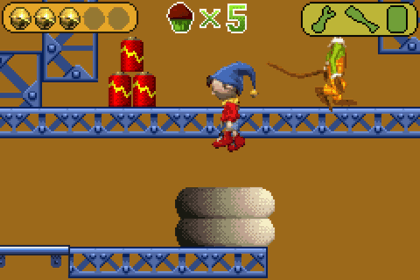 Typically most platformers are a left-to-right affair. When you start a level facing the right, you think you have to go right. 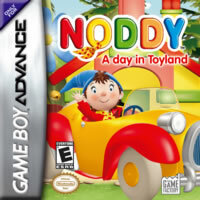 Why would Noddy's car be behind him and all the way to the left? It's dumb! Then, you have a driving section where you have to avoid rocks and tree branches. If the roads are so perilous, why doesn't somebody in Toyland clean them up? If this is a day in Toyland, and every day is like this, I suspect there are also plenty of psychiatry clinics in Toyland as well. I distinctly remember, in the very first episode of the show, Noddy driving across clear empty roads. Surely the developers had access to at least episode one to gather inspiration? I would say the style is on point, but Noddy never looked this soulless. Okay, what kind of title is that!? A DAY in Toyland? And the game is just that. A day in Toyland. Why not "A Day In Thailand"? I'd pay to see that. (I always wondered if Tessie Bear had something hidden under that dress.) Each stage is either a collect-a-thon or a driving sequence. Noddy moves slower than curdling milk on a Texas afternoon. His jumping movement is sluggish, like his hands are tied behind his back. He isn't the Noddy we know and love; something has gone wrong. The text boxes are slow and irritating. The text crawls slowly, while pre-rendered images taken straight from the show are displayed with their grainy artefacts stretched across the screen. The story goes nowhere because there is no story. Just a handful of dumb events that lead into each other like a bad Simpsons episode. No, even those have some semblance of a story, even those set in the past (which nobody liked). The game progresses like a list of chores. Go to place, get the item, find something, talk to whoever. It's insulting. A child would feel despised if somebody had bought this for them. Pre-rendered ugliness. Sluggish character. No story or reason to play. It insults your intelligence. Enid Blyton is turning in her urn.